The fourth annual Rotary Family Health Days (RFHDs) took place throughout sub-Saharan Africa in April 2014, providing comprehensive health care services to the most vulnerable and underserved populations in South Africa, Nigeria, Ghana, Uganda, Lesotho, and Swaziland. RFHDs were conceived, developed and are continually managed by the Rotarian Action Group for Family Health and AIDS Prevention (RFHA). As Rotary’s Area of Focus Manager for Disease Prevention and Treatment, and Maternal and Child Health, I have had the privilege and responsibility to establish strong working relationships with RFHA’s CEO Marion Bunch and her colleagues. This path led to my participation in the kickoff of the 2014 RFHDs in South Africa this past April. Having been involved in many PolioPlus National Immunization Days in years past, I thought I knew what to expect, but I was once again humbled and overwhelmed witnessing the sheer scale of Rotarian volunteer passion and effort to deliver health care services to the most needy of their communities. The opening ceremony in Port Elizabeth, South Africa showcased the power of Rotary and impact of partnerships that RFHA has strategically crafted over these several years. There together on the podium and in the audience, supported by stunning South African high school choral presentations, were Rotarians from multiple districts joined by the highest level representatives of the South Africa Department of Health, the US Embassy, the National US Center for Disease Prevention and Control (CDC) office, The South Africa Broadcasting System, the Coca-Cola Africa Foundation and representatives from multiple NGOs and all tiers of government. 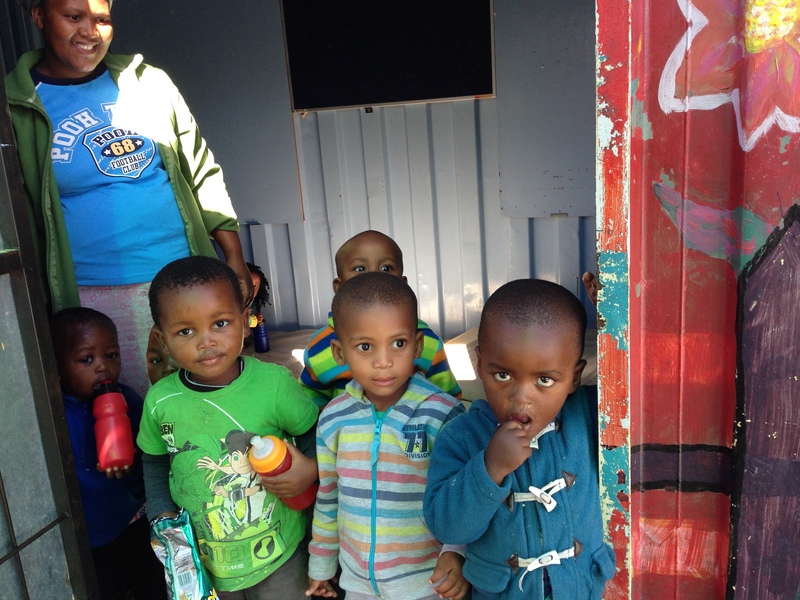 Children line up to receive health services at a Rotary Family Health Days event in South Africa. This goes far beyond the normal pomp and circumstance of many such events. I joined activities in Cape Town for the next few days, a city with one of the world’s highest rates of TB and HIV/AIDS. Over the next several days, thousands of Rotarians and partners rolled up their sleeves to work together, resulting in the provision of disease prevention and treatment services to over 66,500 folks in need. The power of these partnerships, which included the South Africa Department of Health taking full responsibility for follow up on referrals, is what makes RFHDs such an excellent model for high impact, measurable and sustainable interventions. As Rotary continues to explore models for projects that provide large, measurable impacts and are sustainable, we have in our ‘front yard’ a living, evolving masterpiece. Thanks to the thousands of volunteers for their efforts, and many personal thanks to those who took me into their lives and homes.